Irritatingly, my laptop has died for the second time on this trip. So while I’ll still be able to update it will have to be when Luke isn’t using his laptop. It also means limited facebook and everything else since I hate using my phone for anything that involves typing more than 10 letters. First world problems, eh? We booked three nights in Florence, which turned out to be enough time to get a bit of a feel for the place but it was certainly not enough time to see everything. We also had a bit of confusion regarding our accommodation – we arrived to find a note on the door with my name on it. Apparently the toilet in our room was broken so they’d booked us in at another hotel a few blocks away for one night then we’d be staying at another hotel for the second and third nights. Fortunately they were no further from the city, but all the checking in and out and extra taxis cost us money. Fortunately our hotel was near a laundromat. And you know what makes spending an hour at a laundromat better? You guessed it. We didn’t really do much homework on what there was to see in Florence before we arrived. 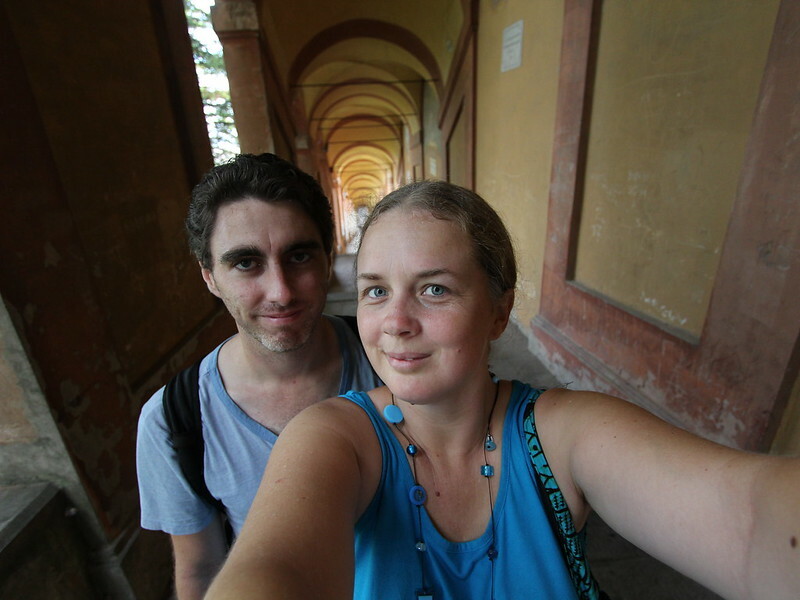 I’d heard of the Uffizi Gallery and Luke was keen to visit that, but otherwise we just strolled around, took some photos and tried to stay out of the most crowded streets. 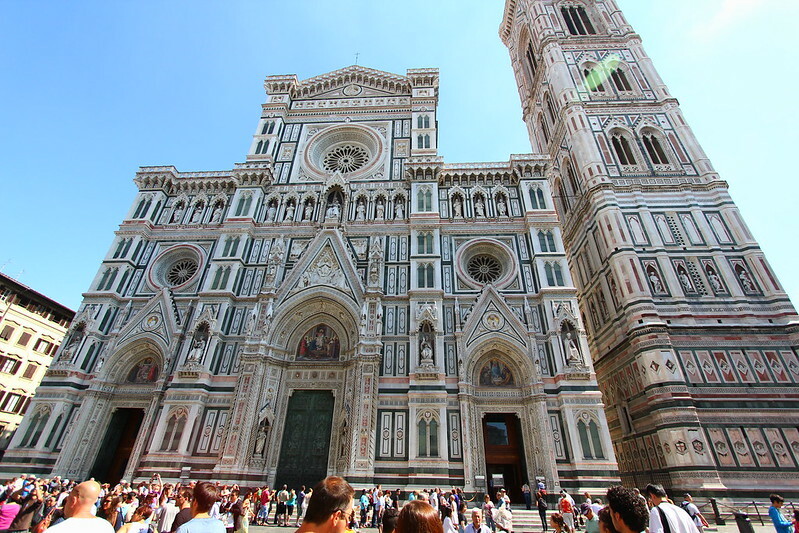 Fortunately Florence is like Rome in that regard – the tour groups all seem to walk the same paths so if you want to avoid them it’s not difficult. Only the main piazzas and places like the Ponte Vecchio (Florence’s most famous bridge, lined with jewellery shops) are jammed with people. On our first night we didn’t do a great deal. After a long nap (Italy seems to have brought out the nonna in me and I’ve had even more naps than usual) we took the advice of Guy I Met On The Train and Taxi Driver From The Station and ate at a restaurant that specialised in meat dishes and particularly a t-bone cut that is in season at the moment and also famous in the region. One serving was big enough for two. In fact it was probably big enough for four. The piece of meat must’ve originally been Flintstones-worthy but was cut into 5 pieces (each of which was a regular steak size but about 3 inches thick) and the ‘t’ bone was upright in the middle of the plate. 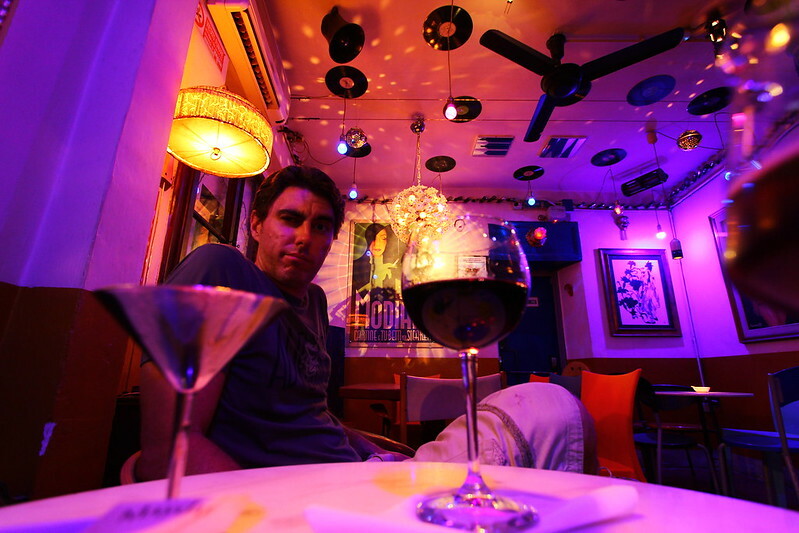 After a day of walking around town and taking photos (and perhaps eating the odd gelato) we spent part of our second evening at the Mayday Club, a small, quirky bar that we found on Tripadvisor which had a glowing recommendation from our friend James. It was indeed an interesting place, but I think we were there too early as we had it to ourselves for over an hour. The drinks were lovely though – I ended up having two glasses of strawberry wine and a cocktail, which ruined my plans for some night time photography. We did a lot of walking in Florence. We walked over both sides of the river and up and down many side streets. We ate some really great food in quiet piazzas and I bought a necklace and some earrings from a little boutique. The Duomo turned out to be much more interesting than I’d suspected… in fact I’ll be honest and admit that I didn’t actually know what it was before we got there and then we rounded a corner and POW! Huge marble cathedral in pink, green and white! It was a bit optical-illusion-y, in that from some angles the statues and detail appeared painted on and the whole thing looked like a huge paper sculpture. I couldn’t get far enough back to fit in this building with my 10mm lens. It’s huuuuge. The Uffizi Gallery, which I *had* heard of, was interesting, although no photography was allowed (obviously I did take a few sneaky photos on my phone because I’m planning on going home, printing them out and selling them as the real thing… I mean *why* are we not allowed to take photos after we’ve paid heinous amounts to get into these places? Hrumph). There were a few paintings I recognised and a few that were amusing and way, way too many Catholic artworks. Which is what they did in those days – I get it – but I’ve had enough. No more old art galleries for us on this trip. We’ve both come to the same conclusion. On to Bologna. I don’t really like jamming two cities into one post. Most people get reader fatigue or something after about 500 words and I also like to make lots of posts so I can say ‘wow, look how many posts I’ve made’, which is stupid but there you have it (115 now! In 6 months! Pretty impressive, huh? If only I’d put all these words into a thesis I’d be a doctor or something by now). So Bologna. It was pretty cool too. We’d decided to spend another 3 nights somewhere between Florence and Venice and Bologna was easy to get to and so decision made! Plus it was going to be another surprise city since neither of us knew anything about it. Actually, this whole trip is kind of dispelling my ideas about myself as a knowledgeable and worldly person. There’s so many places I know nothing about – but that’s the way of things, isn’t it? The more you learn, the more you realise you don’t know. You realise you don’t know that fountains like this could be paid for by city councils rather than, say, feature in men’s magazines. It’s a city that exceeds every other in one respect: porticos. During the 16th century (possibly.. don’t google that. We went to a gallery exhibition on the history of Bologna but my memory is a bit hazy because I’m writing this about a week after but just go with it) when every other city in Italy (maybe Europe?) was telling people to get rid of their porticos, the governors of Bologna mandated that every house had to be fronted with a portico and they had to be at least 4 metres (well, obviously not in metres but you know what I mean) wide and high enough for a person on a horse to ride under. 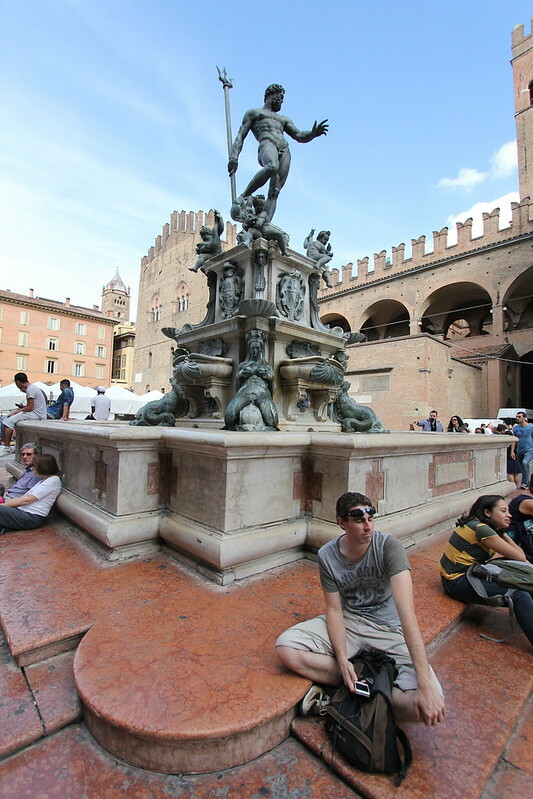 Which means that Bologna has over 40kms of weather-proof footpaths and that is a wonderful thing indeed. Halfway up the world’s longest arcade. One of these walkways goes for 3.4kms without missing a beat – that’s 666 archways, 519 stairs (we counted), not to mention a great deal of ramps, to the top of a hill just out of the city. From the top there’s lovely views over the countryside. For once our pleas to friends on Facebook was early enough to yield results we could actually act on. So thanks Nikki for that piece of advice. 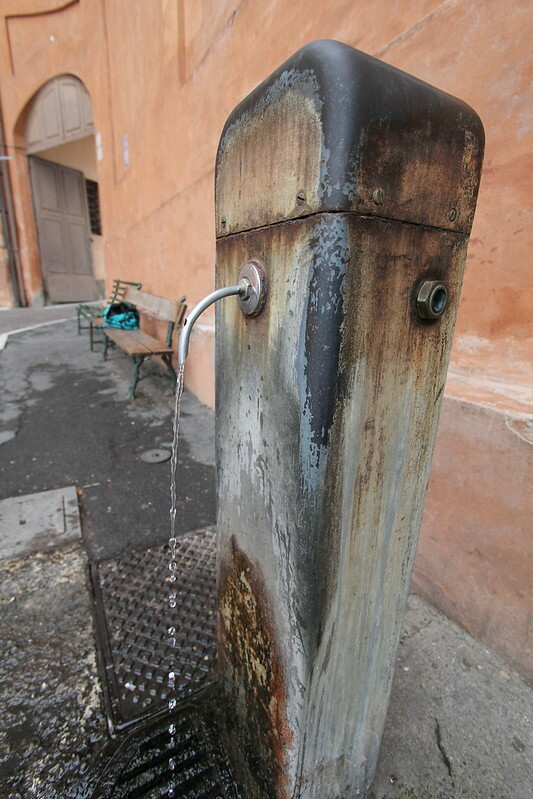 One of the many thousands of water fountains dotted around Italy. One of the many things I love about this country. This one was at the top of the hill. Perfect! Our friend Mauricio recommended a gelateria where we had a dark chocolate gelato that was … I have not the words. Like pure cream but almost bitter, dark and divine. We hiked to the other side of town to have it then on our walk back we found another of the same store within a block of our hostel. D’oh! Speaking of our hostel, it was possibly my favourite from this trip. Not that it was all that special in any kind of luxurious way, but we had a room to ourselves, a four poster bed (handy for drying clothes), marble floors, a well equipped kitchen and it had this lovely old, faded elegance that lent a decadent air to our evening sessions of cooking pasta, drinking wine and watching Archer in bed. I think this is my favourite way to travel. Up at a reasonable hour, walk around lots, eat some great food, retire to bed to relax, watch something funny, write a bit about what I did that day and get a great night’s sleep, uninterrupted by the snores of 4 strangers (dorm accommodation is not my favourite thing). The only other thing I have to mention about Bologna is the colour of the place. The whole town matches superbly in shades or ochre, yellow, salmon (normally my least favourite colour ever), umber, cream… it was another one of those eye-popping cities. Combine the amazing colours with the fresco’d, mosaic’d porticoes and it was a visual feast. Despite all this prettiness, Bologna is full of students rather than tourists and it was nice for a change not to be fighting through the crowds. It was also charming to come across young lovers sitting on railings, leaning in alleys, kissing and canoodling. Italians seem to do that a lot. Speaking of romance, next we’re in Venice! 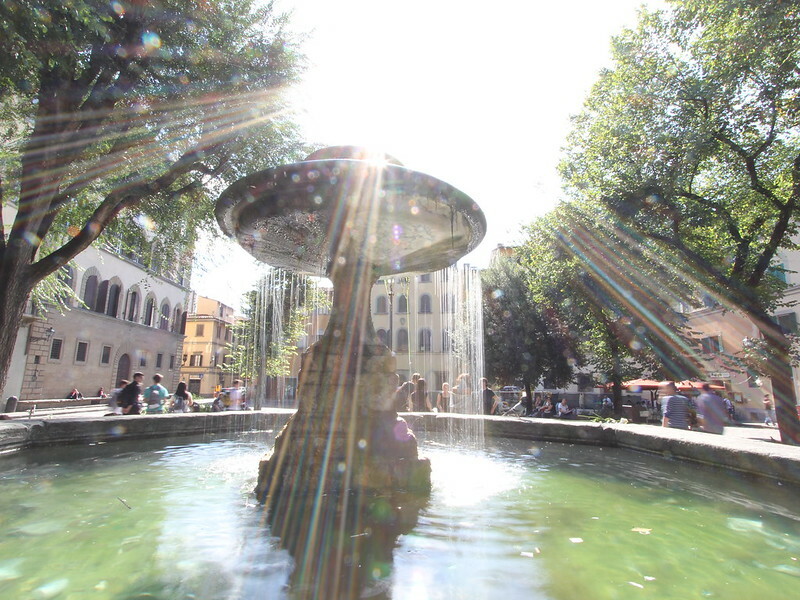 A fountain in Florence. All the lens flare! 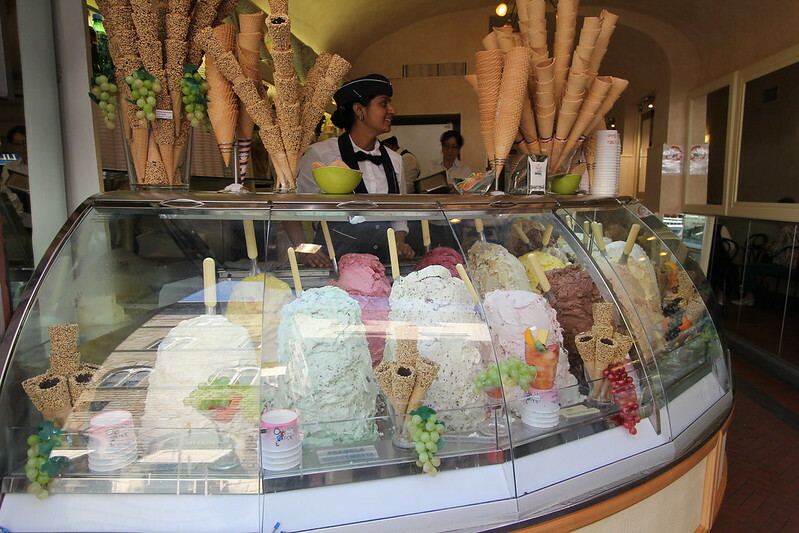 That gelato place looks fabulous! I think I will dream about that tonight! *drools*…. is gelato all dairy free? You can get dairy-free gelato though, and also sugar-free, but it’s less prevalent than the regular stuff. Hi Amanda. I don’t believe I ever realised just how many people there are at all these tourist destinations in Europe, I can’t believe the crowds in so many of your photos! By the way – did you watch the TED talk with Amanda Palmer that I posted on your fb page? Am intrigued to know what you and Luke thought, as I said on there I am not sure if I loved it or hated it, in fact I think I loved parts of it and hated others. The crowds can get pretty massive but we’re just at the tail end of high season here, so if we were traveling to the same places next month it probably wouldn’t be so bad. Although its funny you say that because right now there’s a festival here in Barcelona and its the busiest place we’ve been so far… Packed! Luke just told me about the Ted talk link, I totally didn’t see it, I’ll watch it tonight and get back to you! I do like Amanda Palmer, although really I don’t know a whole lot about her.